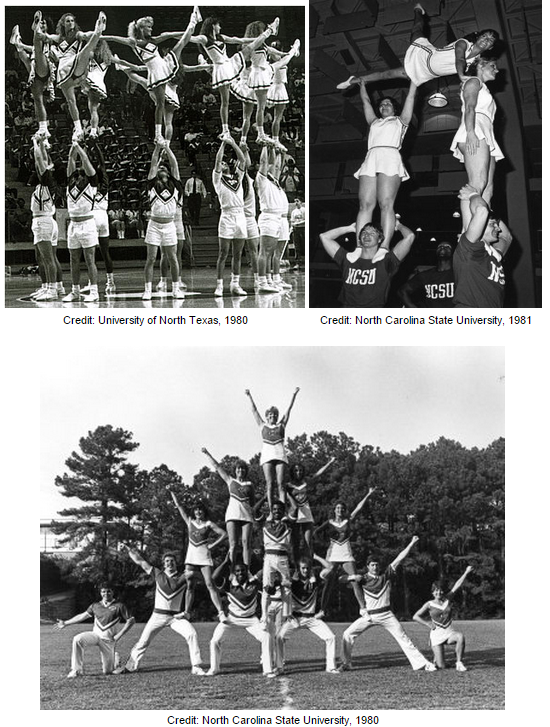 Competition Cheerleading debuts in the 1960’s at collegiate competitions, where university teams battle for awards distributed by the International Cheerleading Foundation (now the World Cheerleading Association) and for a spot on their “Top Ten College Cheerleading Squads” annual ranking. Although mild stunts and tumbling are included in these routines, this new style of cheerleading is still in its initial phases. 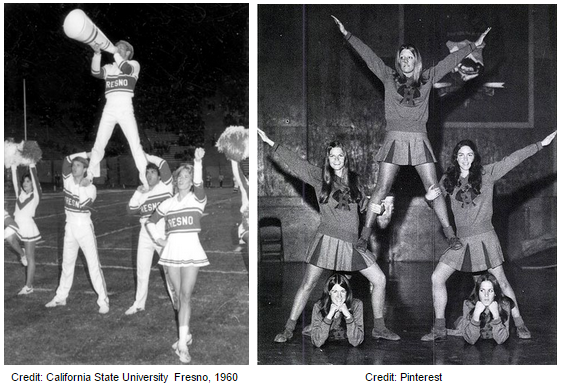 In 1975, the “cheerleading routine” is born at a UCA College Spirit Camp when instructors incorporate music in a cheerleading skills demonstration. Three years later, the Collegiate Cheerleading Championships are broadcasted on television for the first time and people have the opportunity to see cheerleading as much more than sidelines chants and pom poms. Tumbling and stunts also become more advanced. As a result, the sport gains popularity and attracts the attention of prospective athletes. 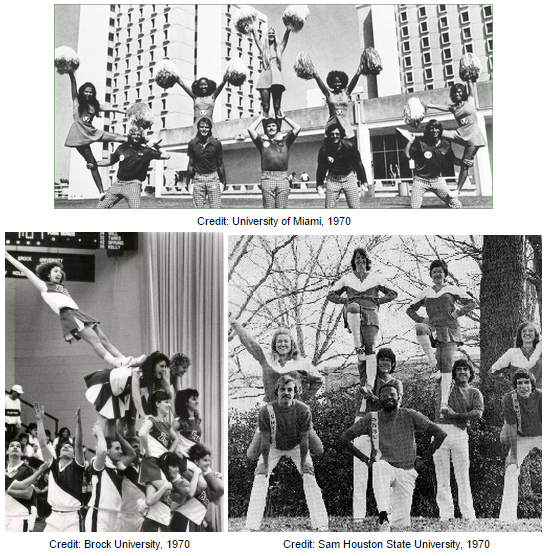 The Universal Cheerleaders Association hosts the first Cheerleading National Competition in 1982. The competition airs on ESPN and increases our fascination with competitive cheerleading even more, especially because routines have become more sophisticated and complex. It is also during this time that competitive cheer becomes an internationally recognized sport with schools across the globe offering cheerleading programs. The 1990’s are iconic of the beginning of the All-Star Cheerleading era. Prior to this, cheerleading programs are mainly offered by schools, but because of the sport’s unprecedented growth, non-school cheerleading organizations begin to develop across the United States. Additionally, the UCA begins sending USA cheerleaders to perform in Europe, Asia, South America and Australia, creating a global interest in All-Star cheerleading. Soon after, international All-Star teams form and begin travelling to various locations in order to participate in world cheerleading events. All-Star teams become known for fast-paced routines that incorporate synchronized dance with impressive stunts and tumbling passes. 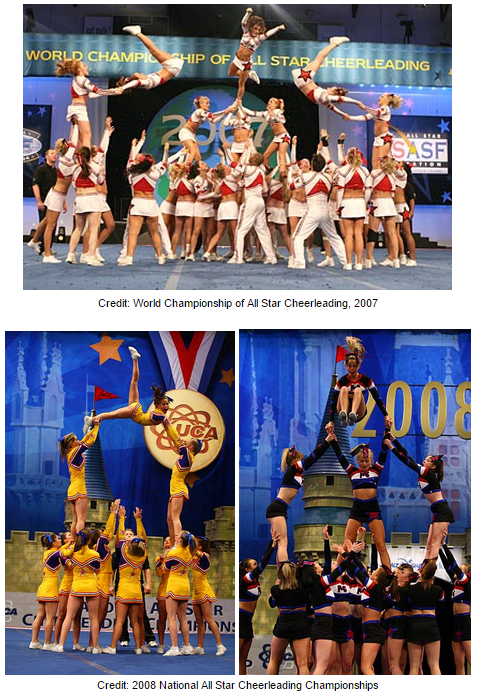 Competition cheer explodes in the millennium and in 2004, the USASF/IASF host the first ever Cheerleading Worlds Championship in Walt Disney World! At this competition, fourteen of the top internationally-recognized teams compete for the World Championship title. The competition subsequently becomes the most prestigious event in the cheer world and is held annually from then on. Today, competitive cheerleading is bigger and better than ever! Routines are jam-packed with jaw-dropping stunts, expert tumbling passes and meticulous choreography. Teams are constantly making routines more creative and more innovative in order to keep up with the demands of increasingly tougher competition. Today’s cheerleaders are undoubtedly forces to be reckoned with. Our cheer-cestors would be proud.